KLAMATH FALLS, Ore. — Archeologists have used ground-penetrating radar to determine exactly where a Fort Klamath soldier barracks stood in the late 19th century. University of Oregon Museum of Natural and Cultural History archeologists on Wednesday used metal detectors and radar to find where the barracks stood at the Fort Klamath military post, established by the U.S. Army in 1863 to protect settlers as they settled in Klamath, Modoc and Yahooskin Indian territory. The museum was awarded a Preserving Oregon $10,000 grant to pay for the work. 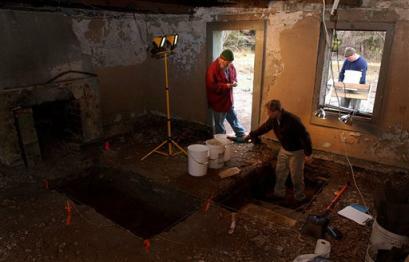 Archeologists went over three sites, but found substantial evidence only at the barracks site. The fort was decommissioned 17 years after the Modoc War, a result of the U.S. government forcing three different American Indian tribes to live together on one reservation. A Modoc Indian the Army called Captain Jack led his tribe off the reservation and the Fort Klamath cavalry was ordered to bring them back. After a year of battle, Captain Jack was captured and hanged; his grave is at the Fort Klamath Museum. In 1966, Klamath County acquired 8 acres of the once expansive fort. In its heyday, the military outpost contained 80 buildings stretching from the museum to the town of Fort Klamath. But in the 75 years the fort was under private ownership, buildings were allowed to disintegrate, leaving nothing but nails and, archeologists discovered Wednesday, a foundation. Archaeology society series kicks off Tuesday | islandpacket.com. For those of who that are Ground Penetrating Radar geeks, or people who have an interest in Georgia’s barrier islands, I just uploaded two short research reports on the subject. Fieldwork for both (St. Catherines Island and Sapelo Island) were done in 2006 and it has taken me this long to put them on the web. These two reports are located at the LAMAR Institute’s report website (Reports 91 and 92). The recent excavation of a prehistoric American Indian burial site on Ossabaw Island revealed cremated remains, an unexpected find that offers a glimpse into ancient Indian culture along Georgia’s coast. State archaeologist David Crass of the Georgia Department of Natural Resources said prehistoric cremations were rare, particularly during the early time in which preliminary evidence suggests this one occurred, possibly 1000 B.C. to A.D. 350. [Elliott’s comment: actually, C-14 dating results, which were obtained shortly after this press release was written place the age of this pit in the Mississippian period, well after the Woodland period estimated age.] The remains also mark the first cremation uncovered on Ossabaw, a state-owned Heritage Preserve about 20 miles south of Savannah. Crass said during this time American Indians in Georgia moved to the coast in the winter for shellfish, then inland in the spring for deer hunting and into uplands in the fall for gathering nuts. “This site may have been a winter season camp,” he said. Erosion from natural causes exposed the burial on an Ossabaw bluff earlier this year. Scientists from the DNR Office of the State Archaeologist, the non-profit Lamar Institute and the Georgia Council on American Indian Concerns worked under the council’s direction to excavate the roughly 6- by 6-foot pit. As required by state law, Crass informed the council about the situation and organized the excavation at the group’s request. The work on Georgia’s third-largest barrier island revealed a cremation pit that had been lined with wood and oyster shells. The body had been placed on top of the wood and the contents of the pit burned. The human remains recovered were primarily from extremities, indicating that the deceased had been disinterred after cremation, possibly to be reburied elsewhere. The charcoal will be submitted for carbon 14 dating, but preliminary analysis of the pottery recovered from the pit suggests the cremation may date to the Refuge-Deptford Phases in the Woodland Period, c.a. 1000 B.C. to A.D. 350. A ground-penetrating radar survey showed many prehistoric American Indian features in the general area, Crass said. The bluff apparently had long been a focal point of prehistoric Indian life. After analysis, the remains will be reinterred in a secure location under the auspices of the Council on American Indian Concerns. 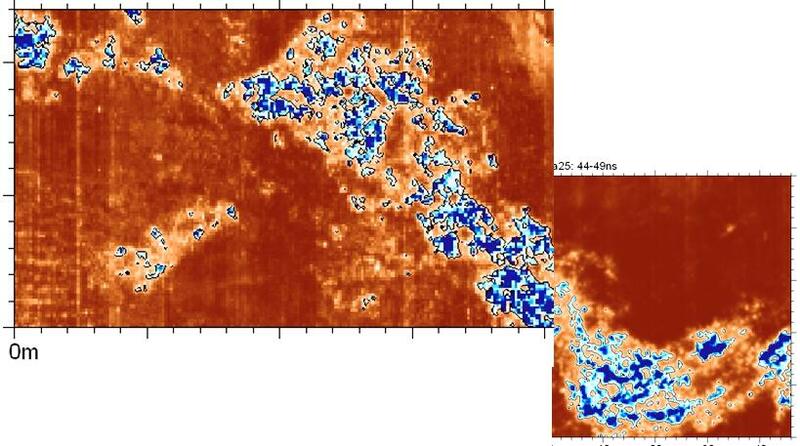 Crass expects the carbon 14 dating results and details on the radar survey by early next year. Human history runs deep on Ossabaw. Shell mounds and other artifacts here date to 2000 B.C. More than 230 archaeological sites have been recorded. Spanish records indicate the island probably had an early Guale Indian village, according to The New Georgia Encyclopedia. But long before the first European contact on Ossabaw, possibly through the Spanish in 1568, small pox and other diseases unwittingly introduced by the Spanish in Mexico and South America had swept north, devastating populations of native Americans. Crass said it’s not known what Indians were on the island when the cremation pit was used. But because of its discovery thousands of years later, more will be learned. Access to Ossabaw is limited to approved research projects and hunts managed by the DNR’s Georgia Wildlife Resources Division. Details at http://www.georgiawildlife.com. Information on visiting the island for research and educational purposes is also available from The Ossabaw Island Foundation’s Jim Bitler, jim@ossabawisland.org. 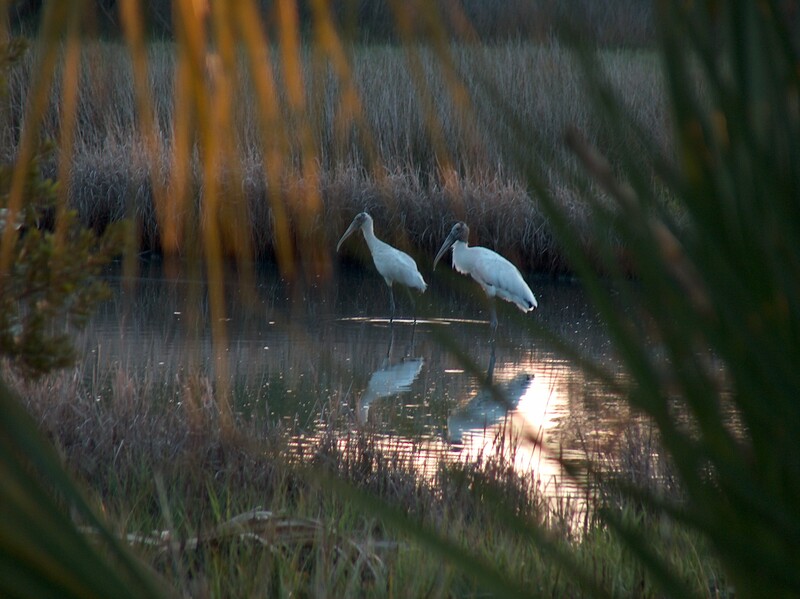 The Wildlife Resources Division works to protect, conserve, manage and improve Georgia’s wildlife and freshwater fishery resources. The division’s mission also includes managing and conserving protected wildlife and plants, administering and conducting the mandatory hunter safety program, regulating the possession and sale of wild animals, and administering and enforcing the Georgia Boat Safety Act. The Historic Preservation Division of the Georgia DNR serves as Georgia’s state historic preservation office. The Historic Preservation Division’s mission is to promote the preservation and use of historic places for a better Georgia. Programs include archaeology protection and education, environmental review, grants, historic resource surveys, tax incentives, the National Register of Historic Places, community planning and technical assistance. For more information, call (404) 656-2840 or visit http://www.gashpo.org. 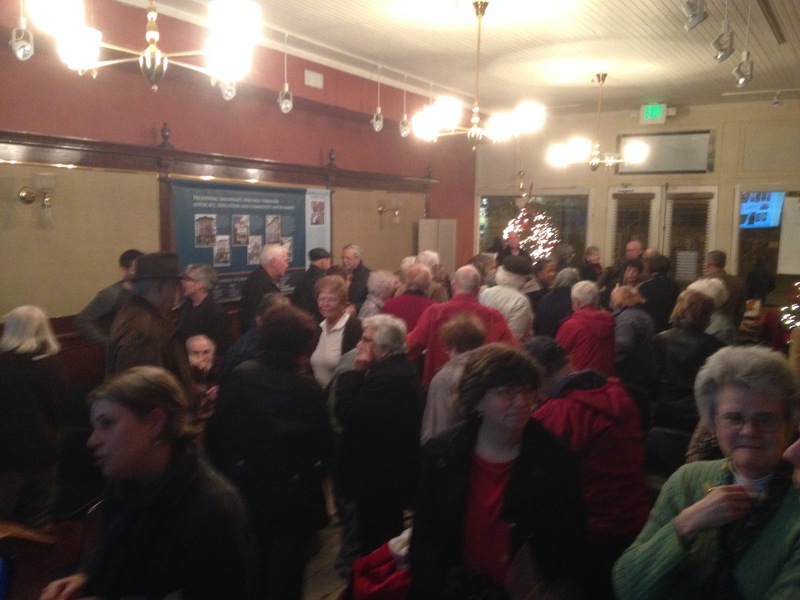 DNR RSS news feeds: http://www.gadnr.org. 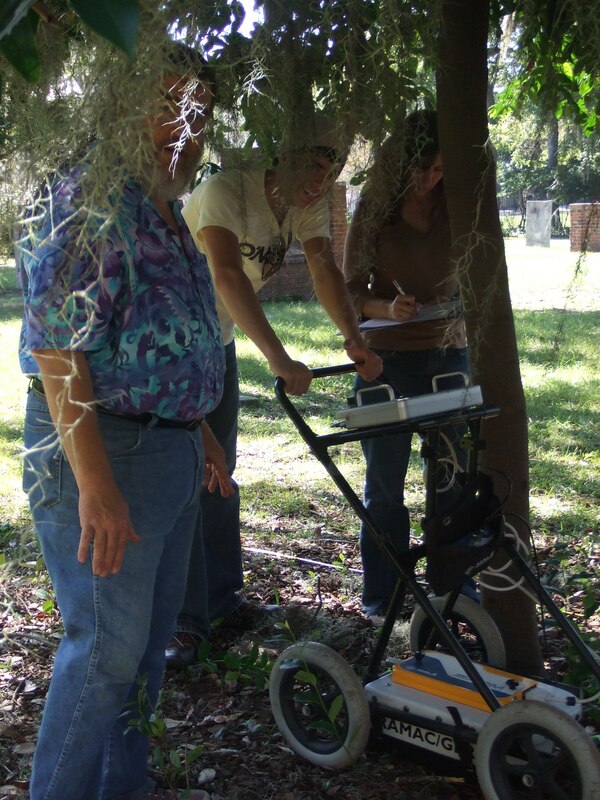 On October 15 and 16, we (Coastal Heritage Society and LAMAR Institute archaeologists and volunteers–the Morris family from Ogden, Utah, conducted a Ground Penetrating Radar (GPR) survey of a portion of the Colonial Park cemetery in Savannah. We examined the southeastern corner in search of a British Revolutionary War fortification ditch. We also mapped in many unmarked human graves and crypts. The results will be published very soon. A good time was had by all. A few pictures of the project follow. The work was tedious but fruitful. GPR Survey of Colonial Park Cemetery, Savannah, Georgia. 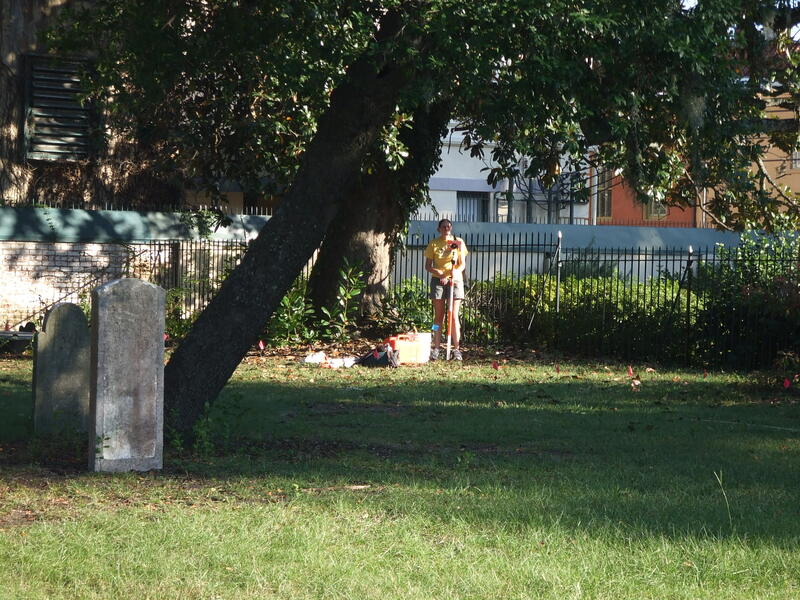 GPR Survey in Progress, Colonial Park Cemetery, Savannah. The LAMAR Institute is a 501(c) (3) organization whose mission is to conduct archaeological and historical research and educate the public about archaeology and history. The focus of the organization is on the Southeastern U.S. 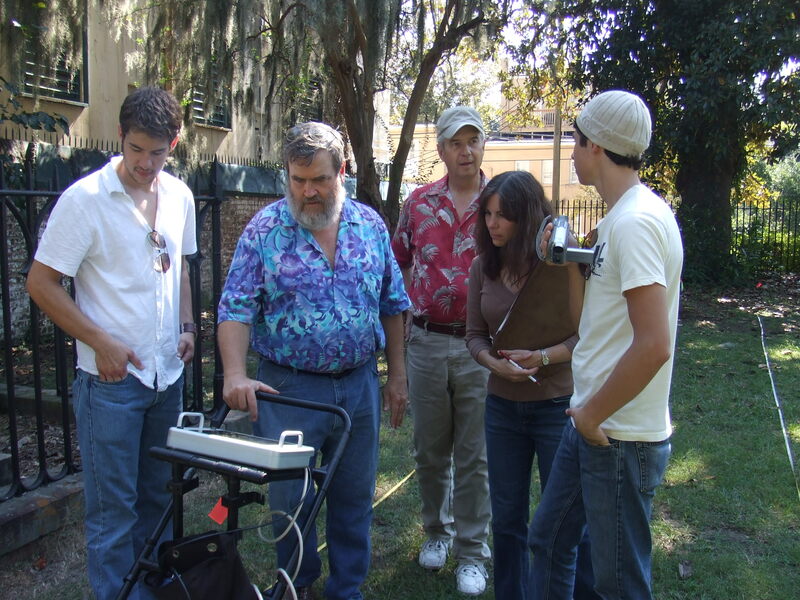 In 2001, the organization added Ground Penetrating Radar (GPR) survey to its list of offered archaeological services. GPR survey is useful for creating 3-D subsurface maps of various cultural features, such as cemeteries and human graves, cellars, fortification ditches, and buried debris fields. The LAMAR Institute GPR Team uses a RAMAC X3M Ground Penetrating Radar system (developed by Mala GeoScience). Shielded 500 MHz and 800 MHz antennae are used. Areas are typically surveyed with parallel radargrams spaced at 50 cm intervals. The GroundVision software program is used for data collection. Once it is collected, GPR field data is post-processed using Easy3D and GPR-Slice software. The field survey is accomplished by a two-person team. 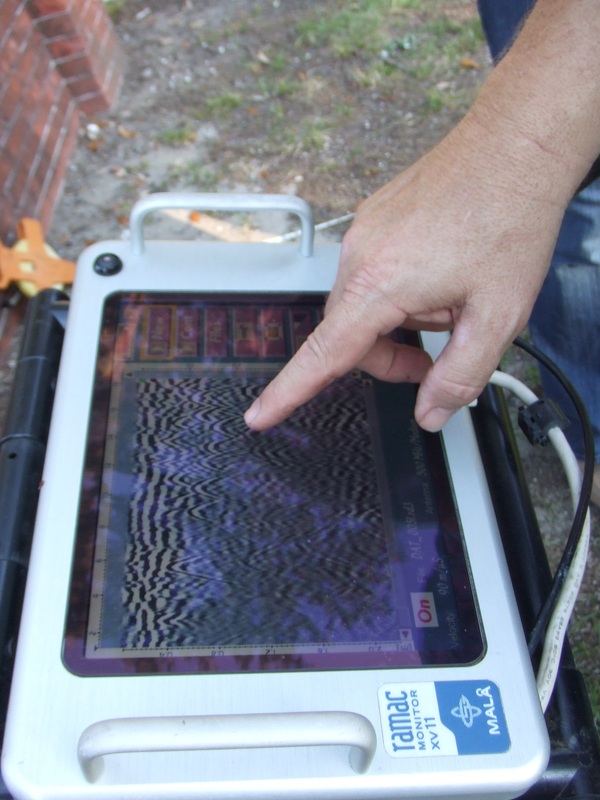 The GPR survey includes post-processing of the data and completion of a GPR Survey report. A series of GPR plan maps and side (profile views) are generated and included in the report. These maps will be annotated to areas of interest, which will be addressed in the report narrative. Examples of The LAMAR Institute’s GPR Survey reports are found on our website at http://lamarinstitute.org/reports.htm. Relevant GPR project reports found on this website include Report Numbers 61, 64, 73, 76, 88, and 102. 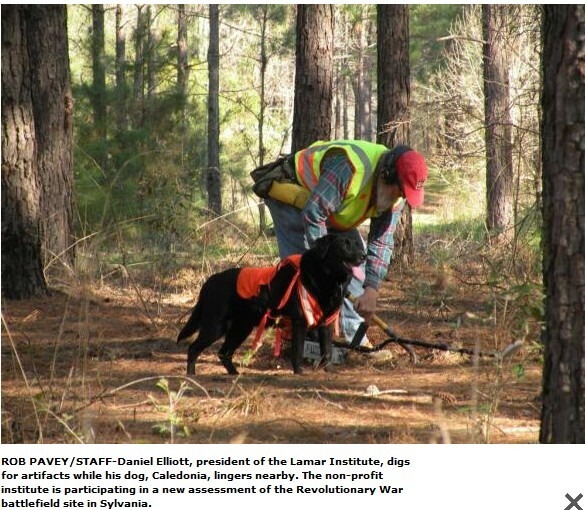 Mr. Daniel T. Elliott serves as top GPR specialist at the LAMAR Institute. 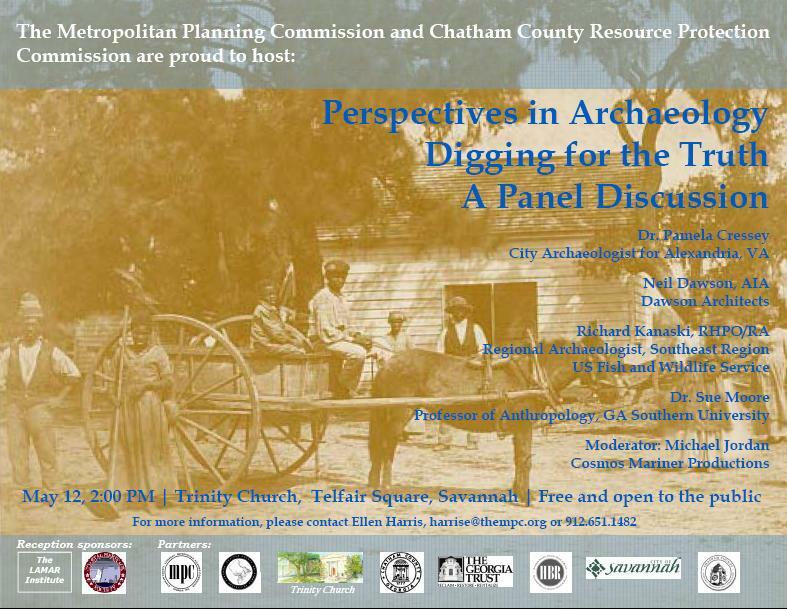 Mr. Elliott has more than 32 years experience in professional archaeology in Georgia. 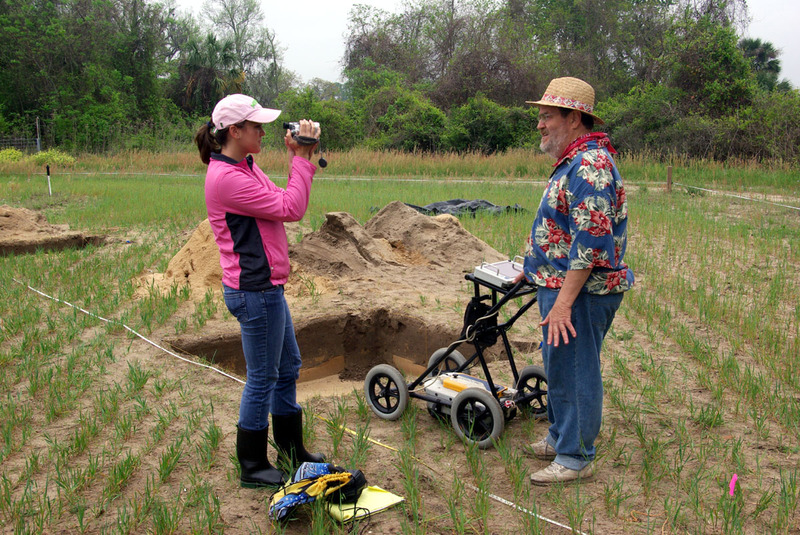 He has served as Principal Investigator on dozens of archaeological projects in the Southeastern U.S. both large and small. 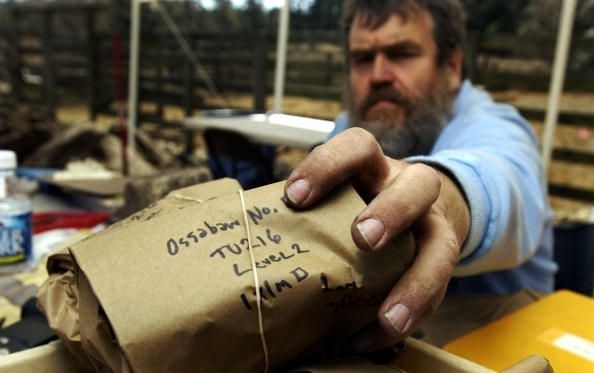 He is recognized as a professional field archaeologist by the Register of Professional Archaeologists (RPA) and is a member in good standing (and past President of) the Georgia Council of Professional Archaeologists (GCPA). Mr. Elliott received his M.A. degree in 1980 in Anthropology from the University of Georgia and has since been employed by federal, state, and private corporations as an archaeologist. He currently serves as President of The LAMAR Institute, which is a non-profit organization in Georgia whose mission is to conduct archaeological research and promote education about archaeology and history in the Southeastern U.S. Mr. Elliott is trained and has more than seven years experience in the use of Ground Penetrating Radar on archaeological sites in Georgia and South Carolina. 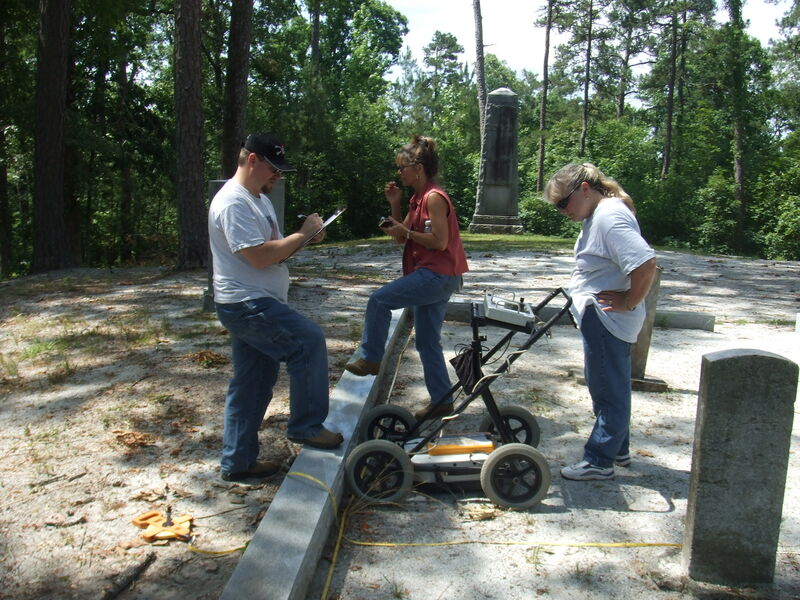 Mr. Elliott has participated in GPR field training exercises in Denver, Colorado, Alexandria, Louisiana, Fort Frederica National Monument, Glynn County, Georgia and Athens,Georgia. These include classes taught by Dr. Larry Conyers and Dr. Dean Goodman. Both of these gentlemen are distinguished experts in the field of GPR survey and analysis, particularly in its application to archaeological sites. Mr. Elliott also has extensive experience in documenting and delineating historic and prehistoric sites in the Southeastern U.S. by using more traditional research methods. The LAMAR Institute has a competitive pricing schedule for their GPR Survey work. The amount of area that can be covered on a weekly or daily basis is contingent on the ground conditions. Generally, survey can be accomplished at a rate of 1,600 square meters per day, or about two acre per week. 1987-Present Research Archaeologist, LAMAR Institute, Inc., Savannah, GA.
1995-2004 Senior Archaeologist, Southern Research, Ellerslie, GA.
1998-1999 Archaeologist, Elderhostel Programs, Georgia Southern University, Statesboro, GA.
1994-1995 Archaeologist, Diachronic Research Foundation, Columbia, S.C.
1992-1994 Senior Archaeologist, Garrow & Associates, Inc., Athens, GA.
1993 Archaeologist, French Huguenot Project, Francis Marion National Forest, S.C., Yale University. 1991 Archaeologist, Tutu Archaeological Project. St. Thomas, U. S. Virgin Islands. 1990 Archaeologist, Hurricane Hugo Archaeological Recordation Project, Government of the Virgin Islands, St. Thomas and St. Croix, U. S. Virgin Islands. 1990 Archaeologist, Law Environmental, Inc., Kennesaw, GA.
1989 Archaeologist, Western Carolina University, Cullowhee, N.C.
1988-1992 Archaeologist, Southeastern Archeological Services, Inc., Athens, GA.
1988-1994 Archaeologist, New South Associates, Inc., Stone Mountain, GA.
1988-1990 Archaeologist, Brockington and Associates, Inc., Atlanta, GA.
1987 Crew member, Petersburg Underwater Survey Project, Clark Hill Reservoir, GA. East Carolina University, Department of Maritime History and Underwater Research, Greenville, North Carolina. 1986 Volunteer, Lake Phelps Canoe Recordation Project, East Carolina University, Department of Maritime History and Underwater Research, Greenville, N.C.
1984-1988 Archaeologist, Garrow & Associates, Inc., Atlanta, GA.
1982-1984 Archaeologist, Sumter & Francis Marion National Forests, U.S.D.A. Forest Service, Greenwood, S.C.
1982 Archaeologist, Soil Systems, Inc., Marietta, GA.
1982 Archaeologist, Memphis State University, Department of Anthropology, Memphis, TN. 1981 Archaeologist, Gilbert Commonwealth Associates, Inc., Jackson, MI. 1981 Archaeologist, Southeastern Wildlife Services, Inc., Athens, GA.
1981 Archaeologist, Soil Systems, Inc., Topeka, KS. 1980-1981 Archaeologist, Southeastern Wildlife Services, Inc., Athens, GA.
1980 Archaeologist, Guy Weaver personal services contract with the TVA, Hartsville, TN. 1980 Archaeologist, University of Florida, Department of Anthropology, Gainesville, FL. 1977-1979 Archaeology Research Technician, University of Georgia, Department of Anthropology, Athens, GA.
2002-GPR Survey, New Ebenezer, Effingham County, GA.
2002-GPR Survey, Fort Morris, Liberty County, GA.
2002-GPR Survey, Horton House and Plantation, Jekyll Island, GA.
2003-GPR Survey, Waldburg Street Site, Hope VI Development, Savannah, GA.
2004-GPR Survey, Sunbury, Liberty County, GA.
2004-GPR Survey, Sansavilla Bluff, Wayne County, GA.
2004-GPR Survey, Woodbine Mound and historic cemetery, Woodbine, GA.
2004-GPR Survey, Beaufort National Cemetery and Proposed Expansion Area, Beaufort, S.C.
2005-GPR Survey, North End Plantation, Ossabaw Island, GA.
2005-GPR Survey, Jones Cemetery, Greenwood Plantation, Thomasville, GA.
2005-GPR Survey, Bull Plantation, Coosaw Community Center, Coosaw Island, Beaufort County, S.C.
2006-GPR Survey, Gould-Bethel Cemetery, Chatham County, GA.
2006-GPR Survey, St. Simons Island Village, Glynn County, GA.
2006-GPR Survey, Fort Hawkins, Macon, GA.
2002 Ground Penetrating Radar Survey at the Horton House Site. Rocquemore Radar Research, Box Springs, Georgia. Submitted to Southern Research, Ellerslie, Georgia. 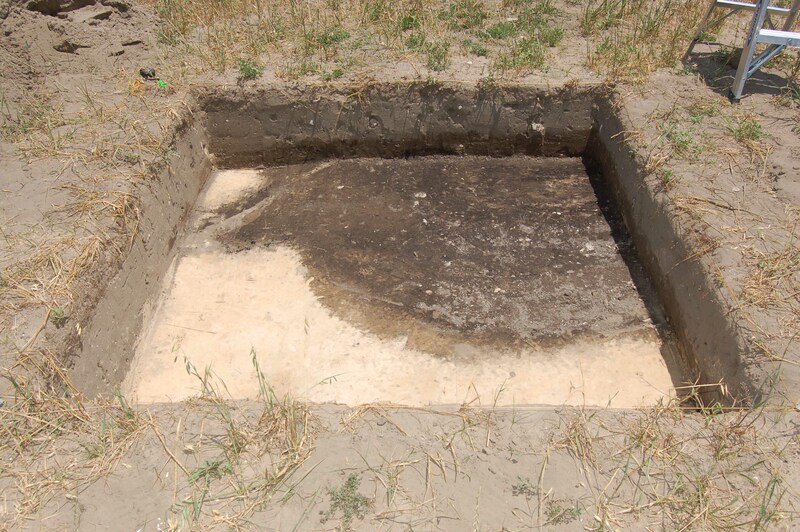 2003 Archaeological Investigations at Fort Morris State Historic Site, Liberty County, Georgia. Southern Research, Ellerslie, Georgia. 1995 Archaic Period Archaeology of the Georgia Coastal Plain and Coastal Zone. Georgia Archaeological Research Design Papers Nos. 7 and 8. University of Georgia, Athens. 2000 Guten Tag Bubba: Germans in the Colonial South. In Colonial Adaptations to the New World: A View from Georgia and the Carolinas, edited by J. Joseph, III, and M. Zierden. University of Alabama Press, Tuscaloosa, Alabama. 1998 A World Engraved, Archaeology of the Swift Creek Culture. University of Alabama Press, University, Alabama. Henry County’s Nash Farm Battlefield Park is Now Open! Nash Farm Battlefield: History and Archaeology, LAMAR Institute Publication Series, Report 123. The LAMAR Institute, Savannah, Georgia, 2007. Atlanta’s Sprawl Threatens Georgia’s Greenspaces. Archaeological survey of the Kettle Creek battlefield in rural Wilkes County, Georgia began in February 2008. A second phase of the field survey will continue to build on the discoveries made during the initial work. The battle of Kettle Creek on February 14, 1779 was a fight between North Carolina and South Carolina Loyalist militia and Georgia and South Carolina Patriot militia. The Patriots emerged the victors in this three hour firefight. Although casualties were relatively slight, this Patriot victory sent a powerful signal to the British invaders that Loyalist support in the Southern colonies was far less than expected. The survey will make detailed topographic maps of the battlefield and carefully locate and recover battle related artifacts. This project is funded by the US Dept Interior, National Park Service, Preserve America grant program and the City of Washington, Georgia. Robert Scott Davis, Jr., Georgians in the Revolution: at Kettle Creek (Wilkes Co.) and Burke County. 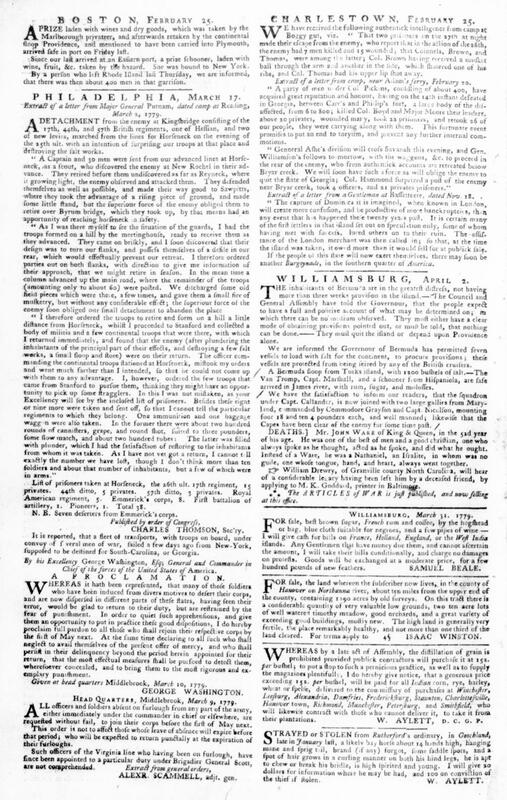 Southern Historical Press, . Easley, 1986.Janet H. Standard, The Battle of Kettle Creek: A Turning Point of the American Revolution in the South. Wilkes Publishing Company. Washington, GA, 1973. Visit the Coastal Heritage Society’s webpage at http://chsgeorgia.org for more information. A one-of-a-kind hands-on experience with archaeology. Kids of all ages will enjoy learning about the “real-life CSI” techniques historical detectives employ to learn secrets from the past. Activities, puppet show, ground penetrating radar (GPR) demonstration–Fun for adults too! 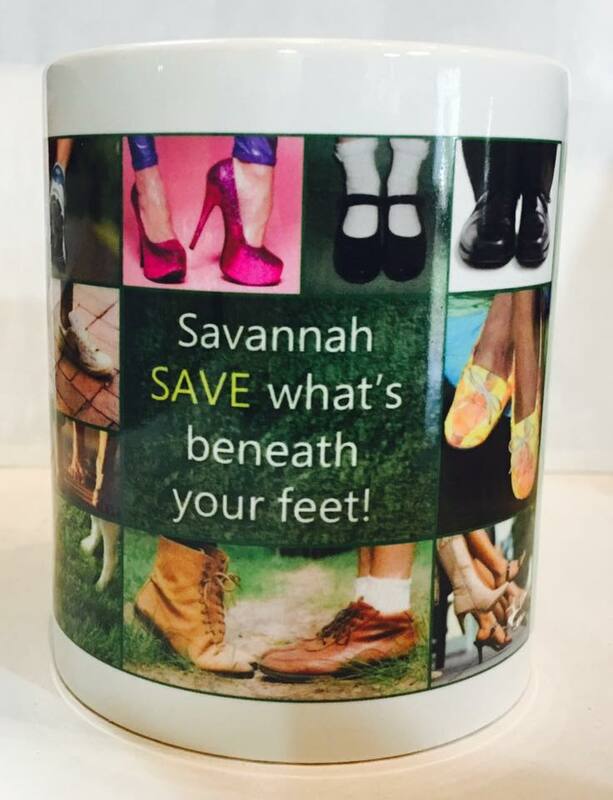 Sponsored by the Savannah History Museum, Coastal Heritage Society, Savannah. KEEP TUNED TO THIS STATION FOR ARCHAEOFEST 2009! Today Coastal Heritage Society archaeologists unearthed several artifacts from the October 1779 Battle of Savannah in Madison Square in downtown Savannah. 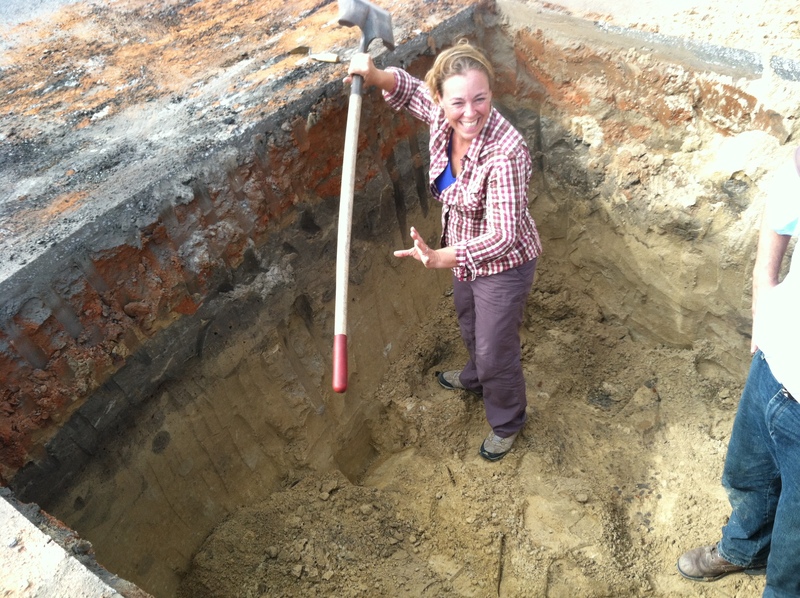 Lead archaeologist Rita Elliott and her team discovered two musket balls—one French, the other British—as well as a shoe buckle, a brass ring, and lots of loose brick fragments, in the northeast corner of Madison Square (the corner sandwiched between the DeSoto Hilton Hotel and E. Shaver, Bookseller). The discoveries come on the fifth and final day of a series of digs that began in Emmett Park on East Bay Street. Elliott believes the site occupies the location of a French and American false attack on British lines, designed to distract attention away from the main attack on the Spring Hill Redoubt—now the site of Battlefield Memorial Park on MLK and Louisville Road. The brick fragments may be remnants of a former military barracks which were torn down prior to the battle to provide cover for British troops defending the city. Ironically, today’s discoveries took place in the shadow of a monument to Sgt. William Jasper, who died in the 1779 battle. The work is funded by a $37,857 American Battlefield Protection Program grant from the National Park Service. 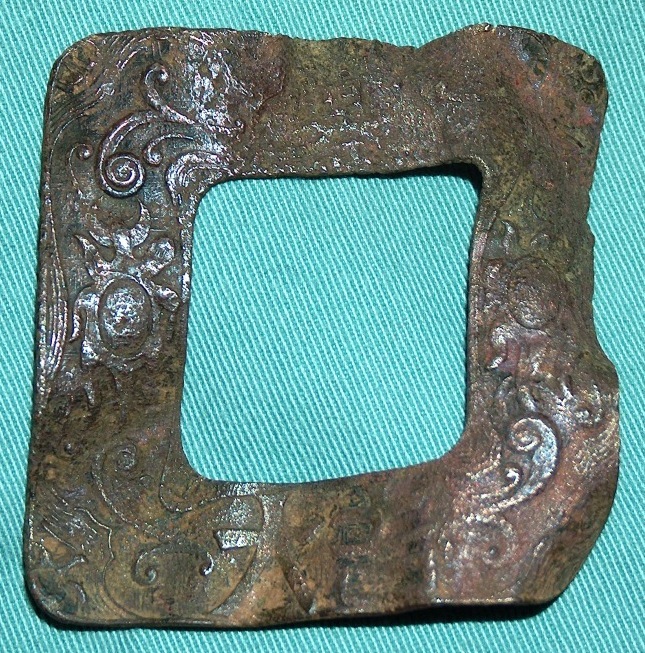 The team used computer software to match modern maps with more than a dozen historical maps, and pinpoint the most likely place to find artifacts. The team is headed by CHS Archaeologist Rita Elliott, who also headed the CHS team that found artifacts and fortifications on Battlefield Memorial Park in 2005. archaeologists Dan Elliott and Laura Seifert round out the team, along with veteran volunteer archaeologist Carl Arndt. This is a year-long project with multiple phases of research, field work, lab work, and report writing. Between 8,000 and 12,000 troops took part in the October 1779 battle. The British forces defeated a combined French and American army, and roughly 800 soldiers were killed or wounded. musket ball that was made into a die. Lucky seven, lucky seven. troops were kept safe from harm, about a half mile to the northeast.